Pretty soon here (we hope) we'll be overflowing in duck eggs. In the meantime, we have an abundance of eggs anyway — the regular order from the local pastured poultry farm and extras from our neighbor. Our neighbor's eggs have the deepest orange color I've ever seen in a yolk! In light of the recent egg recalls, you might wonder why I'd want to showcase eggs. Simply, eggs are great! Backyard eggs and eggs from farmers you trust are real eggs, healthy eggs. The eggs which have recently sickened Americans are industrial eggs — stay away from those. I will * the dishes that can be probiotic, depending on whether you use probiotic ingredients that aren't then cooked — bonus points! 1. Quiche – An easy meal, for sure, and uses up bits and pieces of leftover veggies, meats, and other odds and ends. We have quiche at least once a week — usually for a quick weekend lunch. 2. Egg Salad* — With homemade lacto-fermented mayonnaise and pickles, the flavor factor rises a bunch. 3. Fermented Jalapeno Deviled Eggs* — For those who like a spicy kick! 4. 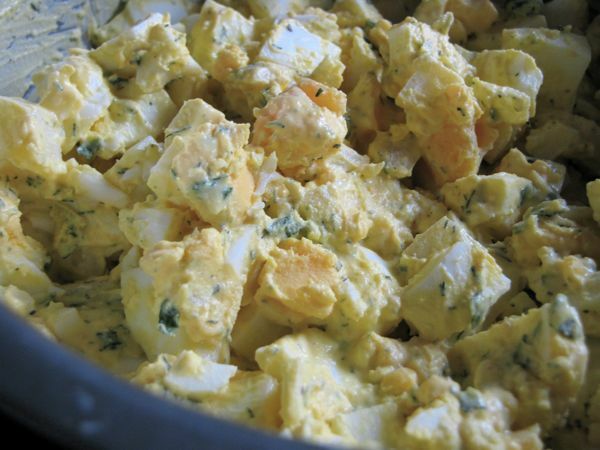 Probiotic Potato Salad* — Great summer picnic or just-because dish to use up a bunch of eggs. 5. 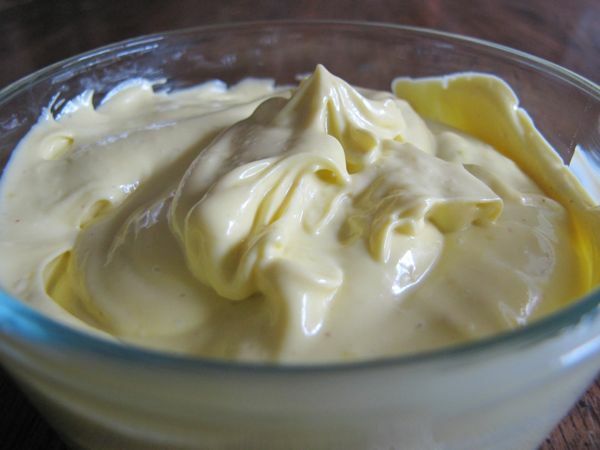 Lacto-Fermented Mayonnaise* — Virtually any sandwich or burger lights up with homemade mayonnaise. 6. Fried Eggs — Fry up your eggs in rotating fats for different flavors. We routinely use red palm oil, coconut oil, butter and tallow. 7. Eggs Poached in Marinara, an idea from Food Renegade — This is really yummy! It's a good way to keep the carbs down without any sacrifice in satisfaction. 8. Pickled Eggs* — Thank you, Marg, for this idea! Use up leftover juices from lacto-ferments. Recently, I used up pickle juice from… lacto-fermented pickles. And yesterday, Paul commented to use the leftover juice from pickled beets/turnips for this. I bet those eggs would be gorgeous and delicious! 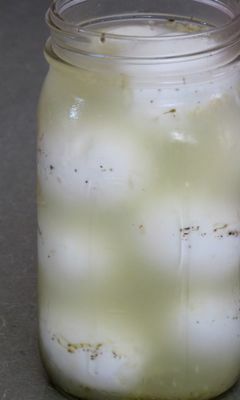 Here's how to do it: Plop the hard-boiled eggs in the juices; you can fit about 8 eggs in a quart size jar and cover. If the juice is ripe with beneficial bacteria (lactobacilli), it is safe to leave out at room temperature for a day (possibly more). Otherwise, transfer to the refrigerator right away to develop flavor. 10. Scrambled Eggs* — Add in leftover meat, veggies, or greens for a boost in nutrition and flavor. When they're done, sprinkle on some raw cheese to melt slightly. 11. Omelettes* — We actually don't have these very often, but when we do, what a treat! Top your omelette with with raw cheese or sour cream for probiotics. 12. 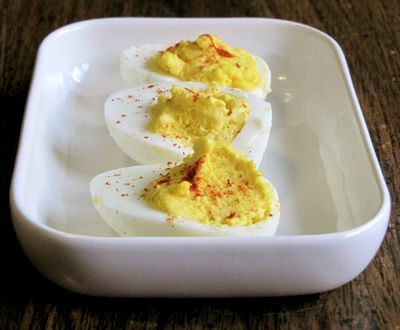 Hard-Boiled Eggs — I love this idea from Katie @ Kitchen Stewardship's eBook, Healthy Snacks To Go. She mentions to keep hard boiled eggs available as go-to snacks. It was a duh! moment for me. 13. 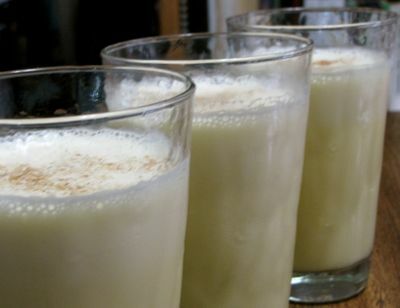 Eggnog* – Not just for holidays! Back off on the sweetener and enjoy the natural sweetness of raw milk or cream. 14. Ice Cream* – Adding raw egg yolks from a local farmer you trust is safe, delicious and healthy. 15. 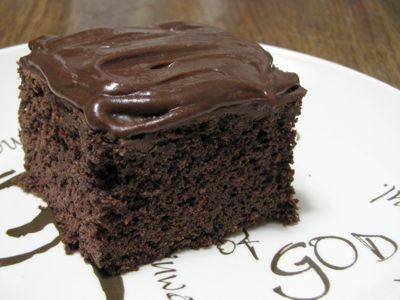 Added to baking, such as sourdough chocolate cake*! So… what are your ideas for eating eggs? C'mon, I know you've got some! I love all the ideas on eggs! Saved this page to my recipe bookmarks! Hi, Rebecca! I love it when one of my pages gets bookmarked. I hope it helps you for many egg occasions! Charity — Yumm! Thanks for sharing that idea! I like incorporating raw eggs into smoothies, and I love the extra goodness it adds in the recipe I got from you, Millie’s Butterscotch Rice. I also scramble some up and incorporate them into a stirfry or skillet dish. The eggs soak up the flavors of the dish and end up being tastier than the meats I use. Katie — Very good ideas! Thank you! Eggs are the main ingredient in any custard-based dish from bread pudding to souffle. I like to make homemade pudding as well as custard pies like lemon meringue and key lime. Also, eggs can be a great addition to skillet meals. Fried rice is a great way to use them, but they also work well in skillet dishes with pasta, cottage cheese, vegetables, and herbs. Another great way to use up your eggs and other left overs is by making a hash. Shelli — Great point about custard-based dishes. I am glad you added the fried rice idea — also made me think of egg drop soup! I’ve got a 4 year old non-eater aso I put eggs in everything! I put 6 raw egg yolks into the NT raw ice cream or make him pudding with 6 egg yolks: http://www.sustainableeats.com/2010/01/23/pantry-pudding/ and I add raw egg yolks in his smoothies too. I also make power pancakes for him: http://www.sustainableeats.com/2009/03/22/whole-grain-buttermilk-coconut-pancakes/ that have 4 eggs in them (plus any additional whites I have hanging around!) and we make a lot of Swedish pancakes (2 eggs, 1/2 cup spelt, 1 cup milk, 1/2 stick butter). I’m not sure what we would do around here without eggs! Annette — You are the egg mama, aren’t you? 🙂 Thanks for sharing your ideas. Your son is well fed, even if he doesn’t know it! One of the ways I got myself to eat my eggs was coming up with a “pizza egg.” It is basically a layered omlette. http://eatingmyvegetables.blogspot.com/2010/08/pizza-egg.html. Since I started GAPs, my husband and I go through 3 dozen or more a week! Jen — Okay, that sounds GOOD. Fantastic idea, thanks for sharing! I agree with the custard suggestion. We love sweet custards for dessert or breakfast. And a savory custard makes a wonderful meal. I use a recipe that Jenny from Nourished Kitchen used in her food stamp challenge from last October (http://nourishedkitchen.com/wp-content/uploads/2009/10/NK.Week2.pdf scroll down to Acorn Squash Custard) as a guide and tweak it to fit whatever ingredients we have on hand. 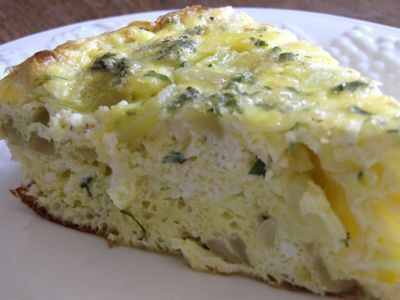 A strata is another great way to use up eggs. Cubed sourdough bread, cheese, veggies, leftover meat (or not) and 4-6 eggs mixed up with milk and poured over it all makes a quick, easy and frugal meal. I’m hoping for duck eggs soon too. I really like duck eggs for doing anything hard boiled. The peel seems to release so much easier on fresh duck eggs than on fresh chicken eggs. Millie, I have never had custard for a meal. I usually think of it as sweet. What a good idea to use Jenny’s recipe as a base. Fried eggs in butter is my favorite. We go through so many eggs each week (quiche, pancakes, waffles). 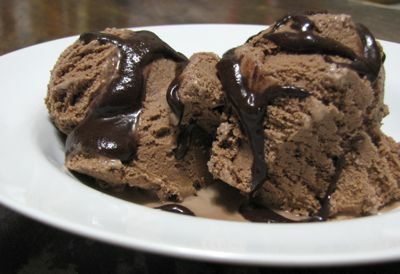 And we make ice cream or creme brulee once a week for Shabbat dinner. I’ll have to explore some of your ideas as well. I will check out your creme brulee, and I love that you use a whole egg. Thanks, Lisa! Chili relleno, where mild green chilies are stuffed with cheese, dipped in egg, dredged in flour, and fried. Or chili relleno casserole (lots of versions out there on the internet). Or for that matter, all kinds of egg-battered foods. While you are on the “just bento” site, try entering “egg” in the search box for 10 pages of results from both “just bento” and “justhungry”, including a Japanese version of Scotch eggs. Scotch eggs are boiled eggs wrapped in breakfast sausage and fried until the sausage is cooked and brown all over, then sliced in half to show the egg in the middle. Very cool! And all of the Justbento recipes, of course, are suitable for tucking into healthy lunch boxes. The miso-marinated eggs are probiotic! I never knew until recently that good-quality (and unpasteurized) miso is a probiotic food. Then there is egg in soups: the Chinese egg-drop soup, and the incomparable Greek avgoulomeno (chicken broth with lemon and egg beaten into it just before serving). Oh, did anyone mention French toast yet? I just love eggs – so delicious and so good for you! Your egg dishes look delicious. I must admit I have never tasted duck eggs though, but I hear they are wonderful. April, we have had duck eggs now and then, but I’m looking forward to getting to know a regular supply. I hear they’re amazing in baking! I just made a garlic flan a few weeks back with fresh bay and thyme – it was amazing. We servied it with sauteed bitter greens. Of course the kids wouldn’t eat it but it was loaded with egg yolks and cream, a great way to absorb all the nutrients from the greens. I also LOVE this recipe in the winter, it’s fast and nourishing and uses softening cabbage from the cellar, kimchee and eggs: http://www.101cookbooks.com/archives/japanese-pizza-recipe.html. You can make it grain free if you like or use any kind of flour or rice to thicken, or omit that for a different texture. Eggs and probiotics! Not sure how I forgot about that one. Annette — The flan sounds amazing. So does the Japanese pizza. I am loving all these ideas — wow! All of these are great ideas. We love grits and eggs – cook up your lime soaked cornmeal. Then add eggs and anything else you’ve got (green chilies, cooked bacon or sausage, cheese of any kind, chopped spinach, etc). Cook (with plenty of butter) until the eggs are done – a bit of real southern comfort food :-). Connie — I’d love to hear more about your lime-soaked cornmeal. You use the lime water from NT? How much of it, with how much water, to how much cornmeal? Sounds sooo good! Wardee – I do use the lime water as described in NT – 1 inch lime in a 1/2 gallon jar. Fill with water. Let stand for 12 hours to settle the lime. Use 1 cup lime water for 1 cup of very coarse corn meal. Soak 8 hours. Add 2 more cups water and salt to taste – cook until thick – maybe 5-10 minutes. That’s it. You can add less water for thicker grits, but we like it this way with eggs because the eggs will thicken it up even more. Hope you enjoy. So timely as well as our little flock is producing 10 to 12 lovely eggs per day— it’s easy to become overwhelmed, so your ideas will really help. Thank you for hosting us and have a wonderful weekend! xo ~m. Mari — That’s what my mom-in-love calls deviled eggs. We like it, too. 🙂 How blessed you are to be getting a dozen eggs per day! Thanks, this is a great list! Now that we’re getting at least a dozen eggs a week, I’ll need creative ways to use them. Beet pickled eggs are great in a greek style spinach salad with homemade feta. Angela, a greek-style salad with beet pickled eggs would be quite a sight! The color! Diana — The irony! I rarely tire of fried eggs, either. I just came across this one tonight. Julia Child makes baked eggs, shirred eggs, and omelets, using both a French long-handled omelet pan (of seasoned iron) and an American-style cast-iron skillet. What amazed me was how fast and hot she cooked them — about 20 or 30 seconds in the pan! One of my favorites is Huevos Rancheros. Along with the custards, souffles, Ice cream, egg salad, etc. like you and others listed. I make German Pancakes, crepes, Italian Wedding soup, greek lemon soup, (Many soups are great with and egg dropped in and slowly stirred,) baked eggs, spam and egg sushi, and chilie relleno casserole, which is yummy, easy, and uses 6 eggs. When you make pickled eggs it is fun to use beet juice in the liquid to dye the outside, then they look pretty when sliced. One other note about the lime water with the corn meal, that is the traditional method of preparing corn for hominy or masa, for tortillas, tamales, etc. When the Spanish took the corn back to Europe they forgot to bring that very important step and the people who started eating lots of cornmeal began getting Pellagra It happened a lot in the US southeast states until to scientist went back to see how the people in Mexico, Guatemala, etc. were growing it and discovered that the people were soaking the corn in an alkaline water where they mixed lime deposits or ash into the water. This makes it easier to grind, easier to digest, taste better, reduces toxins, and frees up the Niacin which prevents the pellagra. (I have done a lot of research on this for teaching kids about the three sisters. Wow, such great recipes! A friend of mine from China introduced me to an interesting dish-it’s basically scrambled egg with a bit(just a tiny pinch) of sugar and maybe a bit of sesame oil mixed with small bits of bitter melon and bigger pieces of tomato. The mild egg, the sweet tomato and the sparks of bitterness from the bitter melon was delicious. She wasn’t too clear on the recipe-language issues-but I think she cooked the melon briefly and stirred the melon and the raw tomato into the egg just before it set. I was just flipping through a cookbook from the 50’s and saw a recipe for creamed eggs on toast- make white sauce, add diced hard boiled eggs, and serve over toast. I’ve never tried it but it sounded interesting. One of the variations called for shredding the yolks over the top instead for a more striking visual affect. Duck eggs and goats milk make the richest custard ever! Definitely a page to bookmark! I love eggs but I don’t eat as many as I should. My favorite is to make a Dutch Baby! Mostly eggs with a small amount of coconut flour and arrow root. It’s become a favorite for our Sabbath brunch with the family. Also, I love that refer to the eggs as “Angel eggs”, it’s what we refer to them as and most people have no idea what we are talking about! 🙂 Thanks for the ideas!! This idea is egg-related. We love eggs but hubby prefers his over easy. I make myself an omelette once or twice a week. My filling is a little sweet onion some drained salsa and a double handful of chopped lightly cooked fresh spinach. fold your eggs over this and top with pepper jack cheese. I get way to many eggs, so I take a dozen at a time and whirl in a blender for about 4 seconds just to mix them up. You do not want frothy eggs. Do not add any seasoning or other ingredients. Then pour them onto my dehydrator trays and dehydrate them for several hours until they are dry. Next step is back into the blender for a few pulses to break up into a powder. Place the powdered egg into a canning jar with an oxygen packet or vacuum seal the lid you can fit about 3 dozen eggs into a quart canning jar. To re-hydrate the eggs use one tablespoon of powder to two tablespoons of warm water mix and allow to sit a few minutes this equals one egg. Use them for casseroles,omelets, baking etc. good for long term storage or in the winter when egg production usually slows down you still have fresh home grown pastured eggs. It’s a good idea to prop up the edges of your dehydrator trays to prevent the liquid egg from running off the flat trays or you will get a big mess. An Egg, stirred up well and slowly drizzled into a hot soup makes a nice addition to it. Or just plain Egg drop soup. Extra eggs go into pancakes or any baking. Scrambled, and cooked up then frozen for quick meals is a good help. Creps with lots of veggie goodies in them….